In theory, you could use your Palm device all by itself, with no other computer involved. But if you’re only interested in doing things the easiest way possible, then the Palm Desktop programs may be the best way to put things in your Palm device. You can carry it around to read your saved data and fiddle with it a little bit, as you see fit. Although you can put information into your Palm device in many clever ways, the desktop program is the simplest and most understandable method for anyone who has used a computer. Before you install your desktop software, you need to hook up the Palm cradle to your desktop computer. Normally, you can simply plug your Palm cradle into the only plug — or serial port — on the back of the PC in which it fits. If you can plug the cradle into the back of your PC easily, you’ve got it made. Just shout “Hooray!,” pass Go, and collect $200 (or just jump ahead to the next section). If you can’t plug the cradle right in, you have to do some fiddling around. Palm Desktop for Windows enables your computer to talk to and work with your Palm device through a process named HotSyncing. You have to install the desktop software only once, and then you’re through. All you need to do after that is place your Palm device in the cradle and press the HotSync button on the cradle every day or so. 1. Put the CD that came with your Palm device in your CD-ROM drive. 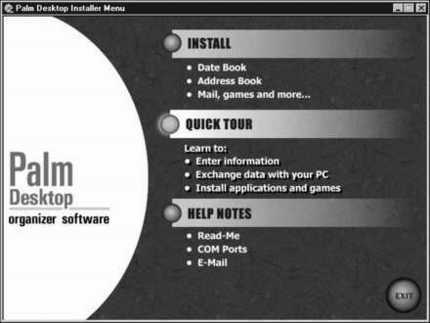 The Palm Desktop Installer menu appears, as shown in Figure 1. 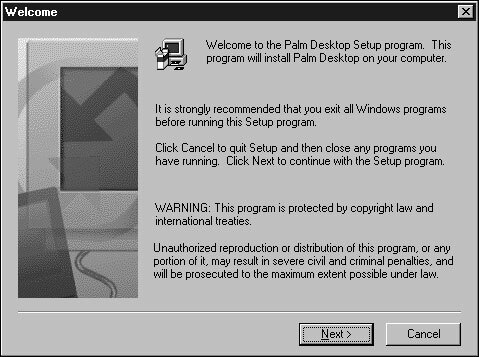 Figure 1: The Palm Desktop Installer kicks off the installation process. The Welcome screen appears and tells you what’s about to happen, as shown in Figure 2. Figure 2: The Welcome screen explains what you’re getting into. The preinstall screen appears, telling you to connect your HotSync cradle, leave the Palm device out of the cradle for the moment, and install the batteries in your Palm device. The Setup Type dialog box opens, as shown in Figure 3. You can choose between a typical installation and a custom installation. Figure 3: The Setup Type screen gives you a choice between a typical or custom installation. Keep it simple; pick Typical. The Serial Port Setup dialog box opens. The only reason for this dialog box is to remind you to put your Palm device in the cradle so that the Install program can test the connections between your Palm device and your desktop computer. 6. Place your Palm device in the cradle and click OK. The Install program copies files for a few moments. If you have a Palm VII, you get to choose which Palm Query Applications you want to install. Otherwise, the Setup Complete dialog box opens. The Palm Desktop Installer closes.